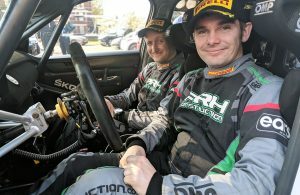 Some big news from stage one of the Eakin Bros Brian James Trailers Stages Rally – Manus Kelly is reportedly off the road just a few corners into the opening stage. He intended to use the event as a test session but it appears his rally has been brought to a premature end. Both crew members are OK are the car is relatively undamaged so they’re making their way back to service. N.I. Champion Derek McGarrity had an overshoot at the final junction on the stage and lost around 10 seconds. 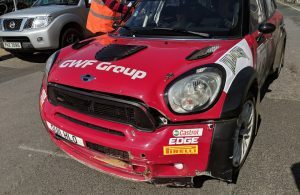 Callum Devine also lost time with an overshoot and isn’t happy with his car’s handling while Alan Carmichael spun and stalled at the same corner as McGarrity. There were no such troubles for Desi Henry who was fastest on the stage. Interestingly, he has registered to score points in the N.I. Championship! 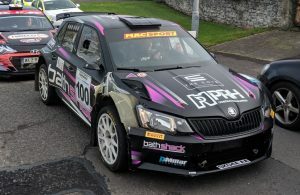 Current championship leader, Derek McGeehan, was second fastest on the stage as he bids to increase his advantage at the top of the tables. Martin Cairns reckoned he was braking too early while Frank Wray has air in his power steering system but his car is still working well. Sean Devine had a moment at the finish of the stage and filled his wheels full of muck. Mark Massey took it easy on the first stage to settle in while Philip Allen caught Massey a couple of miles before the end of the stage. He still set third fastest time but reckoned he lost around 10 seconds behind Massey. Camillus Bradley said he was a bit careful to get settled in but was still inside the top 10. However, Ryan Loughran spun at the final corner but was still fastest in 2WD. Niall Devine has no anti-lag and Declan McCrory hit a wall in his Impreza WRC but is still going, albeit with a time loss of around one minute. ← Previous Story R3: NI Championship heads to Strabane and Donemana for round three!